Regarding the recent flap between the U.S. and Israel over housing settlements in the latter country, British political writer Melanie Phillips understands far better the nature of the situation than President Obama, who, for all his measured oratory, persists in ignoring the history of the Jewish state. The US and the rest blame Israel for thwarting a two-state solution. But the reason the two-state solution has not been achieved is that, from the beginning, this was a two-state problem. Two states were indeed provided in 1920 when Churchill split land already promised to the Jews by giving three quarters of Palestine to the Arabs to create Jordan. The world community ordained that, within the remainder — what is present-day Israel and the West Bank and Gaza — the Jews should be ‘closely settled’ to re-establish their national homeland. The Arabs refused to accept this two-state solution. When they turned to terrorism to destroy the nascent Jewish state, instead of holding the line for law and justice the British offered them half of what remained of Palestine. They refused it then and have done so ever since, because their real aim remains unchanged: one state of Palestine, with Israel destroyed. Phillips is far from a household name here in the U.S., but writing like this deserves a wider audience. The truth of these paragraphs is both powerful and undeniable: There are only two roads to peace in the Middle East. One requires the surrender of Israel to the forces of Arab and Muslim terrorists and the other that these same instigators lay down their arms and join with Jews in moving the country forward. Until this fundamental truth is acknowledged there will be no progress toward peace in the Middle East and certainly no solution, for no such outcome is possible when basing negotiations on lies. Far from rebuking Israel for exercising its sovereignty in its own territory, President Obama should demonstrate his respect for the one nation in the region that is worthy of American support by espousing the truth that everyone must accept to move forward. Then he should declare that only the outcome that leads to a secure, united Israel will be allowed to come to pass. Will Muslims Respond to Barack Obama’s Overtures? Alaa Al Aswany says that Muslims from the Middle East will not respond to Barack Obama’s friendly overtures until they see him taking sides with Palestinian rebels against Israel. I found a combination of glowing enthusiasm for Mr. Obama, a comparison between the democratic system in America and the tyranny in Egypt, the expectation of a fairer American policy in the Middle East, and then severe disappointment after Mr. Obama’s failure to intercede in Gaza. I thus concluded that no matter how many envoys, speeches or interviews Mr. Obama offers to us, he will not win the hearts and minds of Egyptians until he takes up the injustice in the Middle East. I imagine the same holds true for much of the greater Muslim world. Al Aswany, who considers Israel’s recent action in Gaza “a massacre”, is duly impressed with the U.S.’s ability to overcome racial discord in electing our first black president and openly states that the Middle East would be a better place if Egypt and other countries in the region were led by representative government rather than by, as in Egypt, a “head of state who seized power through sham elections and keeps it by force”. But is that really the case? We can reasonably assume similar feelings and outcomes in other Islamic nations should matters be put to the popular vote. Are we to believe Al Aswany’s assertion that what’s missing in Egypt is a fully democratic election system? Hardly, since the one predictable outcome of such elections would be weak governments more under the sway of Muslim clerics and susceptible to the mad desires of radical fundamentalists. Al Aswany’s view of the Israeli action in Gaza is indicative of the greater problem – the combined Muslim/Arab rejection of Israel as a nation. An important measure of the Middle East’s maturity will be taken when – and if – the general populace is finally able to reject pro-Palestinian agitators’ repeated calls for the annihilation of Israel and accept the Jewish state as a legitimate nation in its own right. Until such time there’s little good that can come from unbridled democracy in the Middle East, all wishful thinking aside. Barack Obama presumedly knows this, explaining why his friendly overtures toward the Middle Eastern Muslims have been only oratorical to-date. The truth is that Americans of all walks of life would like to be friendly with Muslims and Jews, Eqyptians, Iranians, and Israelis alike. But the process of getting from here to there will not be an easy one as it requires what President Obama called an unclenching of the fist. This is a rhetorical nicety that really means that Muslims need to de-radicalize before any lasting relationship can be formed. Could that be achieved by democratizing Egypt, Saudi Arabia, and Iran? Only in the sense that Turkey, with its precarious balance between government and military, and Iraq, with a similarly supported elected government, are democratic. A level of social maturity is required before democracy can be considered a positive form of self-rule. Al Aswany is wrong if he thinks it has been reached, whether in Egypt or in Gaza, as the Fatah/Hamas civil war demonstrated beyond dispute. As Nazareth’s Christians prepare to celebrate Christmas, they are playing down the appearance of a confrontational Islamic banner that challenges an elemental Christian belief. 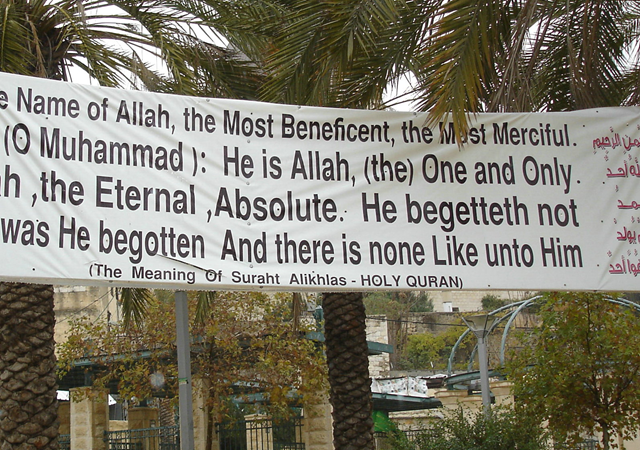 Journalists visiting the city saw two large banners–one in English, one in Arabic–hanging in the plaza in front of the Basilica of the Annunciation, with a verse from the Koran (112:1-4) contradicting the New Testament proclamation that Jesus is the “only begotten” of God. 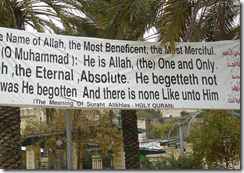 “In the name of Allah, the most beneficent, the most merciful, Say (O Muhammad): He is Allah, (the) One and Only. Allah, the Eternal, the Absolute. He begetteth not, nor was begotten, and there is none like unto him,” the banner reads. Nothing like a little friendly tolerance on Christianity’s big day, is there? CNS goes on to say that Christians in Nazareth say that it’s no big deal. That’s untrue, of course. The truth or lies about the origins of Jesus is one of the two central questions of all time (the other being, “Where did humanity come from?”). Publicly rejecting the fundamental basis for a religion, any religion, is hardly the action of people interested in peaceful relations. Imagine the results of a reciprocal action by Christians in Mecca the day before Ramadan, if you can.